A number of local residents took photos of the solicitation materials they found on their front doors and posted them to Facebook, asking if they were legitimate. 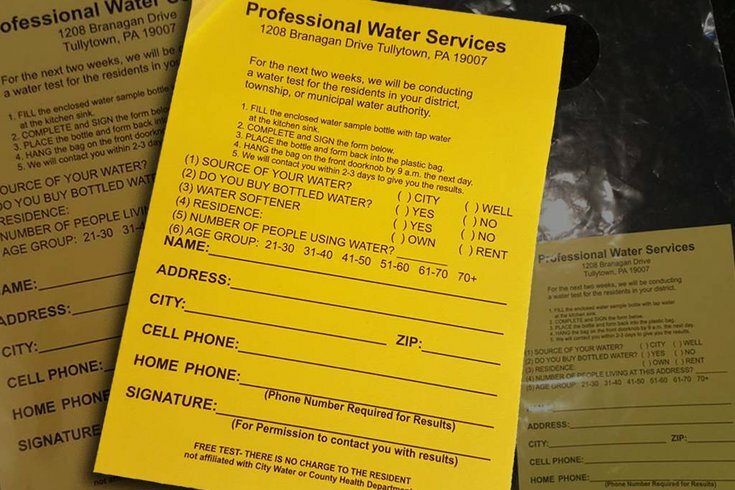 A Bucks County company is using scare tactics in the wake of the Flint, Michigan water crisis to make sales, residents and municipal officials say. The ongoing solicitation in some Philadelphia suburbs by Professional Water Services of Tullytown is leaving many residents worrying, in most cases needlessly, about their drinking water. The timing of the marketing campaign – amid headlines of the crisis in Flint and well contamination in several Montgomery and Bucks County towns – combined with the firm’s alleged failure to tell residents that it sells water conditioning and filtration systems, has municipal officials labeling the effort a bit shady. Several towns have been fielding calls since the fall from worried residents, and some municipal officials have shared concerns with PWS. Nonetheless, the sales effort apparently continues to expand, with the Bucks County Office of Consumer Protection fielding dozens of calls in just two days last week and Warrington Township officials receiving on Wednesday an application from the company for a solicitation license. Last month Bensalem received about 200 phone calls from concerned residents, according to Dawn Davis, the township's community and public affairs manager. “My personal opinion, for whatever it’s worth, is this company thinks they see an opportunity with the situation in Flint, Michigan,” she said. In light of national concerns about Flint, a city rocked by a public health crisis after drinking water was contaminated with lead, and local worries about contaminated drinking wells in the area of two long-closed U.S. Navy bases, the Naval Air Warfare Center in Warminster and the Willow Grove Naval Air Station in Horsham, the campaign is preying on residents' fears, said officials in several municipalities. Bensalem Mayor Joe Digirolamo echoed Davis. The mayor said he was particularly troubled by a survey question on the age of the homeowner. “Seniors and people with babies are going to be the most susceptible,” he said. Numerous calls to Professional Water Services for comment on this story went unreturned. 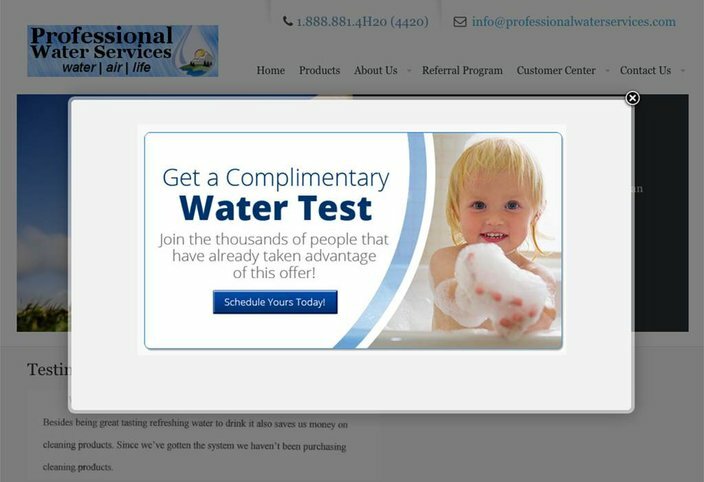 On the Professional Water Services web site, a pop-up window invites visitors to schedule a complimentary water test. Rob MacNamara, a manager with Aqua Pennsylvania, which serves Bensalem, expressed a similar sentiment in a Feb. 10 e-mail to Digirolamo’s office. “I worry about the elderly possibly being singled out,” he wrote. MacNamara wrote that he looked into the situation as the result of PWS doing a similar distribution in Abington Township late last year. Abington Township Manager Michael LeFevre said he reached out to Aqua because of his own concerns. Abington detectives then looked into the matter and determined PWS is a legitimate company, LeFevre said. But the company’s tack still didn’t sit well with him. Herb Schoell, manager of the Upper Southampton Municipal Authority, said his phone “began ringing off the hook for a week or two” in late October/early November with calls from residents, many of whom were seniors, worried about their drinking water. “I called (PWS) and they said they were selling water softeners and I said I had a problem because you’re not spelling that out. You’re implying there is something wrong with the water,” he said. Schoell said the timing was troubling, too. Christian Jones, director of water and sewer in Warrington, said early last week that he hadn’t heard of Professional Water Services or its campaign. Then he reported Thursday that the township, which is dealing with well contamination, got a solicitation license application from the firm Wednesday. Jones declined comment on the company tactic. PWS marketing director Jacob Borochaner wrote in an e-mail to a Bensalem official last month that he was unaware of any complaints made to the company. PWS is in good standing with the Better Business Bureau, with no complaints filed with BBB in the last three years. Michael Bannon, director of the Bucks County Department of Consumer Protection, estimated his office had received 50 calls in two days last week related to the PWS campaign. But he doesn’t see anything that is illegal or would prompt him to contact the firm. Despite the involvement of MacNamara on behalf of Abington, Aqua Pennsylvania spokeswoman Donna Alston said she was unaware of complaints in its service area, which includes Bensalem and parts of eight other Bucks towns along with Abington and 25 other Montgomery communities. She stressed that the water in Bensalem and Abington meets all state and federal drinking water regulations and that Aqua is required to notify residents in its coverage area if that is not the case. She said Aqua would not offer its opinion publicly of the PWS sales effort. Alston did point out that Aqua also offers free water testing to its customers. Bensalem resident Howard Dion said he believes PWS is preying on the fears of folks aware of the Flint situation. But the 72-year-old said it didn’t work with him. “I figured they were trying to sell me something so I threw it away,” he said. Cindy Cossabone Kamm, also of Bensalem, said her husband did the same. "To vigorously promote the benefits of Rainsoft quality water to homes with the highest regard for professional and ethical standards. "To provide our clients with the best water treatment technology, equipment, and service possible. "At Professional Water Services, we realize that our clients are an extension of the way we represent ourselves. Our conduct and attitude will be what carries us into the next generation, and beyond."